Nelson Mandela lived for that ideal and he made it real. He achieved more than could be expected of any man. Today he’s gone home and we’ve lost one of the most influential, courageous and profoundly good human beings that any of us will share time with on this Earth. He no longer belongs to us; he belongs to the ages. Through his fierce dignity and unbending will to sacrifice his own freedom for the freedom of others, Madiba transformed South Africa and moved all of us. His journey from a prisoner to a president embodied the promise that human beings and countries can change for the better. 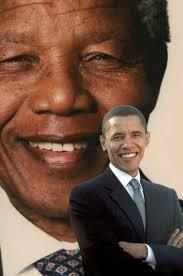 I am one of the countless millions who drew inspiration from Nelson Mandela’s life. My very first political action — the first thing I ever did that involved an issue or a policy or politics was a protest against apartheid. I would study his words and his writings. The day he was released from prison it gave me a sense of what human beings can do when they’re guided by their hopes and not by their fears. And like so many around the globe, I cannot fully imagine my own life without the example that Nelson Mandela set. And so long as I live, I will do what I can to learn from him.